“We have to call a thing a thing,” says Dr. Chezare Warren, a researcher and faculty member at MSU, who asked conference participants to stand up to systemic racism and oppression. There is no neutral ground when it comes to issues of systemic racism and oppression—everyone must take a stance, according to Dr. Chezare Warren, a former teacher and administrator in Chicago Public Schools, now a faculty member at Michigan State University. Social justice, diversity, inclusion. “They’re not just pretty buzzwords,” Warren told a crowd of more than 100 participants at an inaugural conference held last month at MEA headquarters, co-sponsored by Lansing Schools Education Association (LSEA) and MEA. “We have to call a thing a thing,” Warren said in his opening keynote address, quoting author and spiritual advisor Iyanla Vanzant in a turn of phrase that became a mantra echoing through the conference. Local MEA leaders and staff from several units in the Capital-area region organized The Power of You: Impacting Social Justice conference to encourage honest dialogue that leads to action and change, said LSEA President Chuck Alberts. Participants came from all over Michigan. To be effective in encouraging children to learn and grow, educators must seek to understand and honor students’ experiences and perspectives, said conference presenter Shon Hart, a Flint author, speaker, and director of a non-profit dedicated to empowering African-American fathers. In his breakout session, “Why Broken Boys Become Broken Men,” Hart likened educators’ cross-cultural work of understanding students from different backgrounds to football players watching video of games to be more conscious of split-second mistakes they’re making. Dr. Dorinda Carter Andrews, assistant dean of Equity Outreach Initiatives for the College of Education at Michigan State University, discusses the differences between equality, equity, and justice at an inaugural social justice conference co-sponsored by MEA and a local association. Broken boys might appear at school as withdrawn and unmotivated, or they could act out and challenge authority, Hart said in a riveting talk that occasionally sparked spontaneous cheers and applause. Lansing educator Jami Brown attended the conference as part of a one-year administrator apprenticeship program she is involved in this year. She chose sessions carefully, because there were many speakers she wanted to hear from, she said. Breakout sessions covered a wide range of important topics, from trauma, to LGBTQ victimization, poverty, micro-aggression, and bias incident response. Cari Cravotta, an elementary music teacher in East Lansing, said she couldn’t wait to report back from the conference to faculty at her school. Cravotta belongs to her building’s equity team developing means and methods for creating an open, accepting, inclusive community. 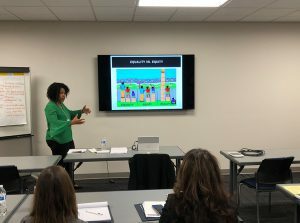 There is a difference between equality and equity, noted Dr. Dorinda Carter Andrews, assistant dean of Equity Outreach Initiatives for the College of Education and associate professor in the Department of Teacher Education at Michigan State University. 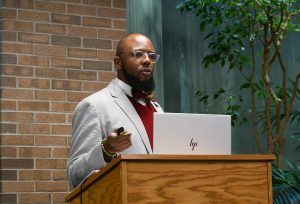 Carter Andrews delivered the event’s closing keynote address and also presented a session on culturally responsive teaching that acknowledged the terms have become ill-defined buzzwords. Equality works if need is the same, she said. Equity ensures access to opportunity. Schools should not be asked to solve these issues alone, she said. All of society’s institutions should be working together, but change can begin with individual awareness and reflection. Discussing issues and making curricula more inclusive are good places to start. Several non-profit organizations operated vendor booths at the conference to connect participants to resources. The conference was eight months in the making, and organizers hope to continue the work with future events and further coalition-building. “It’s a good start, but it’s just that—a start,” said Ron Parkinson, a Capital-area UniServ director among many who pitched in to plan the conference with grant money from NEA and MEA, adding that organizers hope the event will continue to broaden its reach going forward.